It has been estimated that 1.8% of women of childbearing age (16–44 years) develop intracranial aneurysms; whereas cerebral arteriovenous malformation (AVM) has prevalence rate of 0.01%–0.5% and generally presents symptoms at 20–40 years of age. Pregnant women with such neurovascular lesions pose great challenges to anesthesiologists because ruptured cerebral AVM and aneurysm are associated with significant maternal as well as fetal morbidities and mortalities. To date, there is no clear guideline in literature regarding the mode of anesthesia for these high-risk parturients presenting for nonneurosurgical intervention. 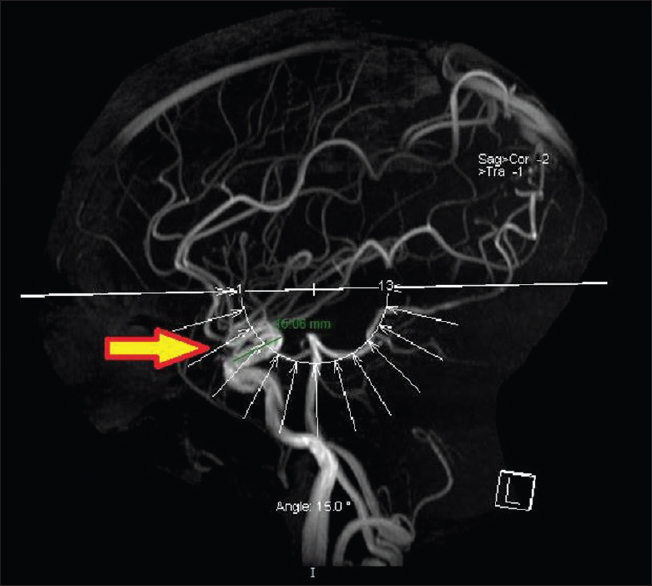 A 29-year old primigravida had a history of left-sided cerebral AVM, which was treated with gamma knife surgery 10 years ago, but she was lost to follow-up after surgery. She was admitted to hospital during her first trimester of pregnancy for a near syncope episode with no neurological deficits or seizures. Although full radiographic investigations could not be offered due to the pregnancy, she was offered magnetic resonance imaging (MRI) of brain after appropriate counseling by neurosurgeon. Cerebral MRI showed residual AVM in the left parietal occipital lobe measuring 15 mm [Figure 1]. There was no immediate neurosurgical intervention required to treat the AVM. The multidisciplinary decision was made to proceed with elective cesarean delivery at 39-week gestation. Epidural was performed at L3-4 intervertebral space, 15 mL of 2% lignocaine with 1:200,000 adrenaline was used in aliquots over 10 minutes to achieve bilateral blockade to T5. Baby was delivered uneventfully with Apgar score 8 and 9. The patient remained hemodynamically stable throughout the surgery and was monitored postoperatively with hourly conscious level and blood pressure monitoring. Patient was discharged well on third postoperative day and was followed up by neurosurgery. A 32-year-old primigravida had incidental finding of intracranial aneurysm on left carotid siphon, right supraclinoid, and carotid siphon 4 years ago that was conservatively managed. She was otherwise well during her pregnancy and was scheduled for elective cesarean section at 39-week gestation. Spinal anesthesia was performed in sitting position via midline approach at L3-4 intervertebral space. Total 2.2 mL hyperbaric bupivacaine 0.5% with fentanyl 15 mcg were administered intrathecally to achieve blockade to T3. Patient was haemodynamically stable throughout surgery and baby's Apgar score was 9 and 9. Intracranial hemorrhage from an intracranial aneurysm or AVM is a serious complication and is responsible for 5%–12% of all maternal deaths. Hemorrhage due to AVM or aneurysm occurs predominantly during the third trimester, but bleeding may occur at any stage including during labor or in the puerperium. The emergency neurosurgical management of these patients for bleeding AVM or aneurysm should be the same as in nonpregnant patients since this offers the best outcome for both mother and baby. Nevertheless, some studies,suggest that pregnancy itself is unlikely to greatly alter the natural history of a previously asymptomatic cerebral aneurysm, given the relative infrequency of rupture during pregnancy. It would, therefore, seem reasonable to defer treatment (either with surgery or with endovascular intervention) in asymptomatic patients until after delivery. The uterine contractions of labor and the Valsalva effect of vaginal delivery can be accompanied by dramatic, transient increases in venous pressure, cardiac output, and cerebrospinal fluid pressure. However, there is no evidence that vaginal delivery is associated with an increased bleeding risk in parturient with intact AVM or aneurysm. In this case series, elective cesarean section was the recommendation of the multidisciplinary team, taking into considerations the theoretical increased risk of intracerebral rebleeding during vaginal delivery due to Valsalva maneuver at second stage and the exaggerated hemodynamic changes during labor and patients' wishes. The primary goal of anesthesia is to maintain cardiovascular stability. Hypotension could compromise the uteroplacental perfusion, cause vomiting, and further compromise hemodynamic stability, whereas hypertension could increase the risk of AVM and aneurysm rupture. In the absence of established guidelines, we discuss the options of general anesthesia (GA) versus regional anesthesia for parturient with neurovascular lesions undergoing cesarean section. GA with opioids, propofol, and volatile anesthetics had been described as safe in emergency cesarean section in these pregnant women. GA offers control over hemodynamic parameters and is useful if patient is anxious, but all the side effects and complications of GA for cesarean sections (e.g., neonatal respiratory depression and possible neurological effects, maternal failed intubation, etc.) still applies. Hypertensive responses to laryngoscopy and extubation could be obtunded pharmacologically by using intravenous nitroglycerin, fentanyl, remifentanil, lignocaine, and short acting beta blocker. Invasive blood pressure monitoring offers tighter arterial pressure control, which means intracranial pressure and uteroplacental perfusion can be kept at appropriate levels. Control of ventilation will also allow the anesthesiologist to keep PaCO2 at low normal to minimize cerebral vasodilatation. Central neuraxial block offers some advantages compared with GA. Hemodynamic instability caused by airway manipulation, increased intracranial pressure associated with positive pressure ventilation, and emesis associated with GA can be avoided. Comparing epidural and spinal block, epidural anesthesia allows more gradual onset of sympathetic blockade, favors hemodynamic stability, and has less hypotension-induced vomiting. However, anesthesiologists must be prepared to manage inadequate anesthesia and subsequent GA conversion, which may cause hemodynamic instabilities. In addition, epidural and spinal anesthesia is associated with the risk of a sudden change in transmural pressure across the aneurysm or AVM (due to CSF release) and may predispose to rupture. In such circumstance, GA is comparatively safer for the neurological risks than spinal or epidural anesthesia. In conclusion, optimal anesthetic technique should be dependent on individualized assessment of patient and multidisciplinary management is vital in this type of high-risk neurological patients. The neurosurgeon who looks after the patient should be alerted regarding the patient's delivery plan and be ready to be activated if intracerebral bleed occurs in the peripartum period. The emphasis of anesthetic management is to maintain stable systemic, cerebral, and placental hemodynamics, while avoiding increased intracranial pressure in the parturients in order to achieve successful outcomes for mother and baby. Kim YW, Neal D, Hoh BL. Cerebral aneurysms in pregnancy and delivery: Pregnancy and delivery do not increase the risk of aneurysm rupture. Neurosurgery 2013;72:143-9. Agarwal N, Guerra JC, Gala NB, Agarwal P, Zouzias A, Gandhi CD, et al. Current treatment options for cerebral arteriovenous malformations in pregnancy: A review of the literature. World Neurosurg 2014;81:83-90. Dias MS, Sekhar LN. Intracranial hemorrhage from aneurysms and arteriovenous malformations during pregnancy and the puerperium. Neurosurgery 1990;27:855-65. Wilkins RH. Natural history of intracranial vascular malformations: A review. Neurosurgery 1985;16:421-30. Liu XJ, Wang S, Zhao YL, Teo M, Guo P, Zhang D, et al. Risk of cerebral arteriovenous malformation rupture during pregnancy and puerperium. Neurology 2014;82:1798-803. Tiel Groenestege AT, Rinkel GJ, van der Bom JG, Algra A, Klijn CJ. The risk of aneurysmal subarachnoid hemorrhage during pregnancy, delivery, and the Puerperium in the Utrecht population: Case-crossover study and standardized incidence ratio estimation. Stroke 2009;40:1148-51. Coskun D, Mahli A, Yilmaz Z, Cizmeci P. Anaesthetic management of caesarean section of a pregnant woman with cerebral arteriovenous malformation: A case report. Cases J 2008;1:327-9. Ong BY, Cohen MM, Palahniuk RJ. Anesthesia for cesarean section – Effects on neonates. Anesth Analg 1989;68:270-5. Ng K, Parsons J, Cyna AM, Middleton P. Spinal versus epidural anaesthesia for caesarean section. Cochrane Database Syst Rev 2004;(2):CD003765.